We accept referrals from dentists all around England, and lots of dentists recommend us with patients having travelled far and wide to visit Dr Jasani for root canal treatment. Dr Jasani has had formal extra training and a lot of experience in root canal treatments, coming top of his cohort of colleagues during his final exams. 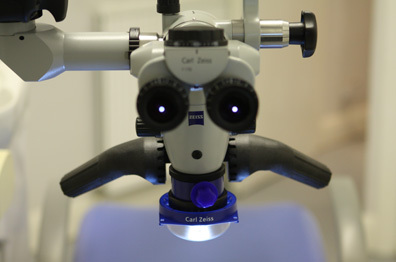 He uses all the latest gold standard equipment including a special microscope which lets him see a lot more detail when performing the treatment. Dr Jasani’s experience and expertise has meant that he has become one of the most popular teachers of root canal treatments in London, teaching qualified dentists ranging from newly qualified dentists all the way to dentists with many years of experience. In addition to this, at Malden Dental Care, every effort is made to make the environment as comfortable as possible with strong anaesthetics available when required. A soft padded nappa leather dental chair is provided for patients so that they remain comfortable during the whole procedure. A fabulous service, quick and professional. I was very nervous regarding the lead up to my root canal treatment but throughout my treatment I felt confident that I was in the right place and hands to get the job done. Thank you.